The final version of the Guidance for Local Health Boards and Local Authorities on the Establishment of Joint Schemes for the Delivery of Local Primary has now been released by the Welsh Government. 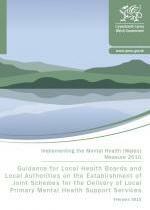 This document is aimed at providing guidance for Local Health Boards and Local Authorities in Wales to support the implementation of Part 1 of the Mental Health (Wales) Measure 2010. Primary Care, Health Boards, Local Authorites and Practitioners all have an important role to play in the implemenation of Part 1 of the Measure which specifically deals with Local Primary Mental Health Support Services and how they are embedded within localities in a robust way. Mental Health Legislation Team, Welsh Government, Cathays Park, Cardiff CF10 3NQ. Barbara Bowness, Primary Care Lead, Mental Health (Wales) Measure, National Leadership and Innovation Agency for Healthcare, InnovationHouse, Bridgend Rd, Llanharan CF72 9RP. If you have any questions about anything contained on this page or trouble downloading any documents please contact our Project Manager Lesley Hills via email at lhills@rcgp.org.uk or on 029 2050 4516.